If you would have offered a local business owner free commercial time during Super Bowl LIII, he or she would likely have been elated. In fact, many struggling local business owners would much rather have their message broadcast to a national audience than a local one. When it comes down to it, that might be why their marketing is failing to engage customers. For a variety of businesses, local advertising is one of the most effective ways to get customers into a store. Some of the most promising channels are community blogs, small local newspapers, and frequently updated events pages that keep users coming back for more information. However, before sinking your entire advertising budget into ads at every bus stop around town, make sure you’re getting the most for your money. Local advertising is often thought of as low-tech, but that needn’t be the case. Like any ad campaign, the most effective local ads are informed by a wealth of data. To ensure that your ads resonate with your intended audience, follow these three steps to let local work for you. 1. Cast your net on a niche. Too many business owners decide to target “men between 24 and 30” or “young professional women,” either because it’s easier than digging into the data to find out who their customers actually are or because they think casting a wide net will help them catch more prospects. Instead of targeting huge swaths of the local population, narrow your audience — and your messaging. That doesn’t mean you have to exclude a potential customer base. Rather, identify multiple target audiences and alter your message — and the platform you deliver it on — to fit each niche group. Lathan Fritz, founder of Amerisales, explains the value he’s seen in taking this approach. “We run national campaigns for our clients, but we’ve found that some of their best dollars are spent targeting locals. If we run a compelling ad directed at a specific niche, let’s say purchasing managers in Chicago, pretty soon you’re actually talking directly to that individual, and you know who they are and what they’re looking for.” Narrow your audience by examining what types of people buy your products or services. Analyze the audience analytics on your data management platform, and send surveys to your best customers. Focus on learning why they love what you have to offer, what pain points they share, and what makes them act. 2. Local is online, too. Local advertising doesn’t have to be direct mail or a 2×4 sign at the local Little League field. Facebook ads let you construct geofences and limit your audience to a specific area, while the Google Maps ad feature allows business ads to appear in location search results. With the right targeting, you can show ads to people in certain areas at certain times, meaning you can increase local traffic right when you open or aim to bring in more customers at happy hour. For instance, New York’s Korean fusion restaurant BarKogi uses local awareness ads that change based on the time of day. If users see the ads on a weekend morning, they feature a tempting brunch offer. In the afternoon, ads spread the word about upcoming happy hour specials and encourage audience members to grab a drink with a friend. Depending on your business, you can use local ads on Facebook or Twitter to ensure that people in your area know what you offer and when it’s available. 3. Digitize to gain eyes. Another alternative to a direct mail ad or static billboard is digital signage, which you can easily update. 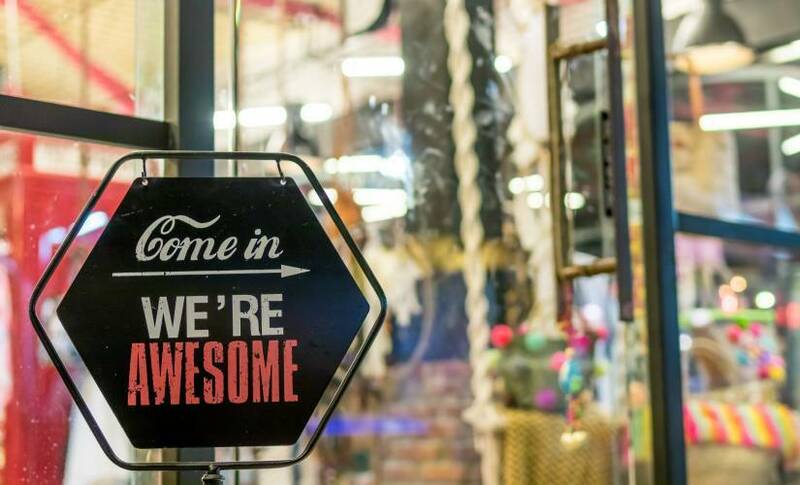 A 2019 report on digital signage in the retail market states that a whopping 94 percent of retailers use or have used in-store digital signs. According to a study conducted for Impax Media, grocery store shoppers notice digital screens when they’re waiting in a checkout line, and 84 percent said that the visual content helped them pass the time as they waited. For small business owners, whether a screen is in a checkout line or at a gas pump, it represents an opportunity to combine the power of digital advertising with local messaging. Put messaging on screens around town, from bus stops to digital billboards. You can even keep customers entertained during their dreaded visit to the DMV by advertising on the Motor Vehicle Network (MVN). No matter where you place ads, ensure they make viewers feel that your brand understands their experience. For example, a bakery ad on the MVN might tell customers, “You deserve a treat for checking the DMV off your list.” If you have a brick-and-mortar presence, you can use digital signage to promote your offerings in-store. Even national brands see the value in this, as evidenced by General Motors adding digital signage to its local dealerships, allowing the company to better personalize its campaigns to each specific region. The “support local business” movement might be taking off, but that doesn’t mean local sells itself. Given a choice between Starbucks and a local coffee shop the customer isn’t aware of, the choice is clear. It’s the job of local ads to change that choice. As with any ad campaign, local advertising needs data to flourish. Instead of broadcasting a message to a widespread and unreceptive audience, local businesses must take the three steps outlined above to identify their customers and engage them in ways that generate results.